I am just a bit overwhelmed. Digging through the archives from Hessen has been quite an adventure. Not only have I found a great deal of information about the family of my great-grandfather Isidore Schoenthal, but I’ve also been wading through the archives searching for records of my Hamberg ancestors—that is, the family of my great-great-grandmother Henrietta or Jhette Hamberg of Breuna, who married Levi Schoenthal, Isidore’s father. These German records are amazing. Unlike my experiences searching for records in Poland for my Brotman ancestors, I am just swamped with information about my German paternal ancestors from Hessen (and I haven’t even begun looking at the records for Isidore’s wife, my great-grandmother Hilda Katzenstein, whose family was also from Hessen). I am still compiling and editing the Hamberg information, and I am ready to start writing more about what I know about the Schoenthals later this week. But for now here’s a little bit of what I’ve learned about the Hamberg family. As mentioned, they were from Breuna. Breuna is another small town in the Kassel district of Hessen, not too far from Sielen (about 26 km), where the Schoenthals lived. According to the town’s official website, as translated by Google Translate, Breuna is 758 years old. I could not find much about its history, but according to the town website, it was under the control of various aristocratic families over the centuries. Today the original small village of Breuna where my ancestors lived is incorporated into a larger town, also called Breuna, consisting of five districts, one of which is the smaller village of Breuna; another is Oberlistingen, where some of my other relatives not yet discussed lived. 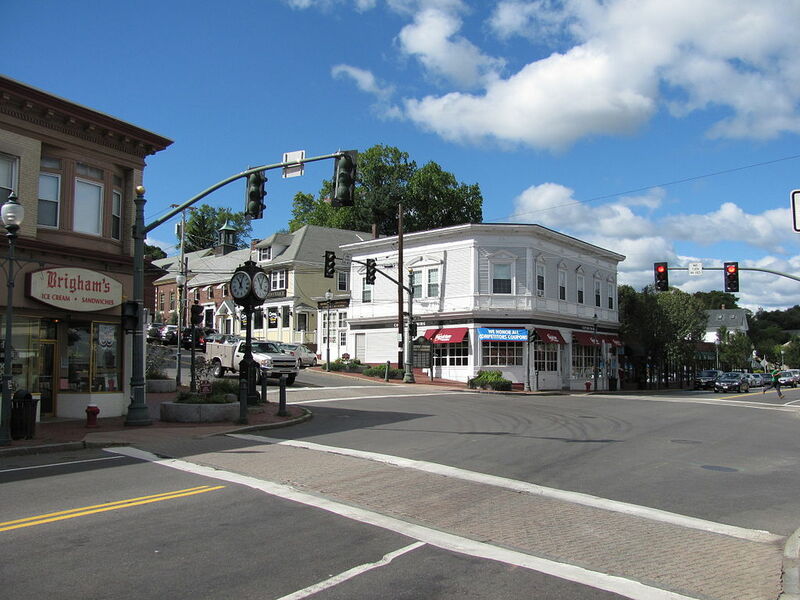 The town’s website described the town as an “Arbeiter-Wohnsitz-Gemeinde” or “worker-resident community,” where most people commute to the larger cities for work. Particularly noteworthy are the natural, wooded, yet convenient position of the municipality. Pure nature with freeway access! The advantages of a rural environment without having to sacrifice the most important social and cultural institutions and the relative proximity to the North Hessian metropolis of Kassel, the beautiful half-timbered towns Hofgeismar, Wolf Hagen, the spa of Bad Arolsen and the East Westphalian town of Warburg. The website goes on to point out that although once an agriculture-based economy, Breuna no longer is primarily agricultural. There are only a few full-time farmers, and they focus on pigs, dairy, and grain. The population of the larger Breuna town today is about 3700 people, with the smaller district of Breuna consisting of about 1500 people. 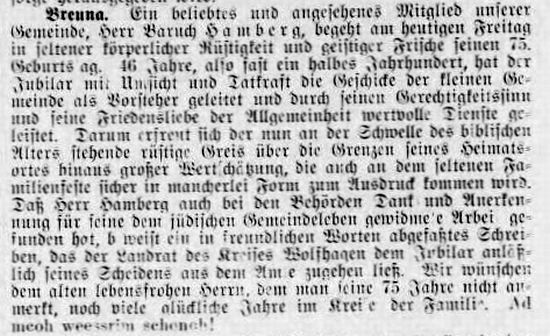 As for Breuna’s Jewish history, the Alemannia-Judaica reports that there were four Jewish families in Breuna in 1744 and 1776. By 1833, there were 53 Jewish residents, and after that the Jewish population started to decline. There were 29 in 1871, 40 in 1885, 33 in 1895, 23 in 1905, and 14 in 1910. 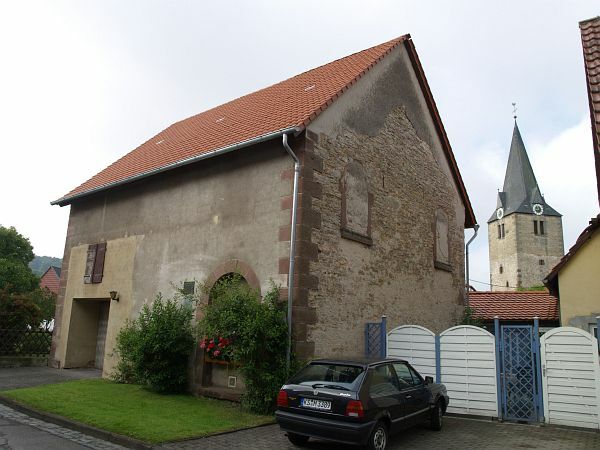 The overall population of the town was between 900 and 1000 during these years, so the Jewish population was quite a small percentage of the overall population. Most of the Jews were engaged in horse and cattle trading, and some were farmers. 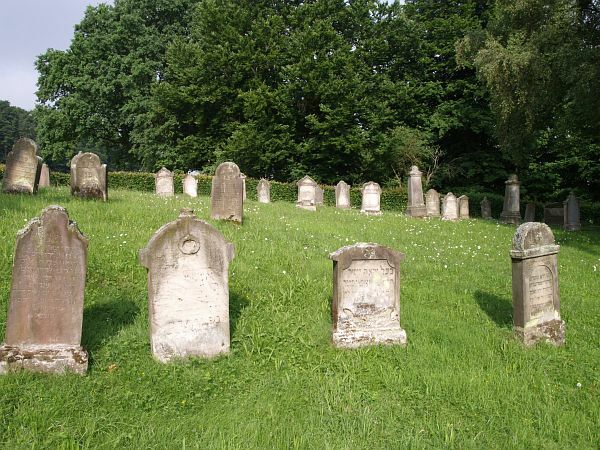 There was a synagogue, a school, a mikvah, a chevra kadisha (burial society), and a cemetery. There was still a small Jewish community in Breuna when the Nazis came to power in 1933. Almost none of those who remained survived the Holocaust. For close to fifty years, the leader of the Jewish community in Breuna was Baruch Hamberg, according to Alemannia-Judaica. He was my second cousin, three times removed, as described below. His 75th birthday celebration was written up in one of the local papers in an article describing his prudence and vigor and wishing him many years ahead. How was Baruch related to me? From my research, I’ve learned that Henrietta Hamberg, my great-great-grandmother who married Levi Schoenthal, was the daughter of Moses Hamberg and Guetchen Rosenberg. According to at least one record, Moses was a cattle merchant. Moses and Guetchen had nine children (or at least that is how many I have located so far). 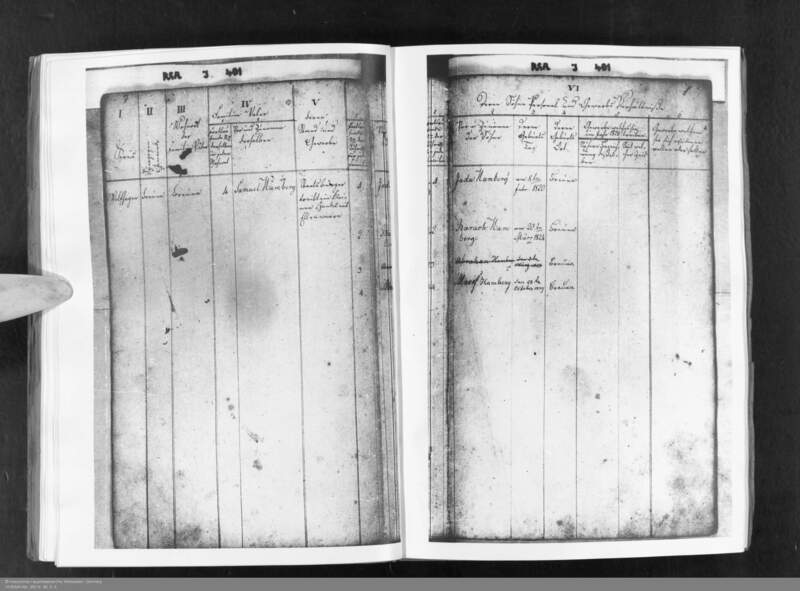 One family tree on Geni says that Moses was born in Burgsinn, Bavaria on June 12, 1777, but I’ve not found any definitive source to corroborate that. That tree also says that Moses’ father was named Juda and that his mother was Rachel Simon, but I am still looking for corroboration of those facts as well. 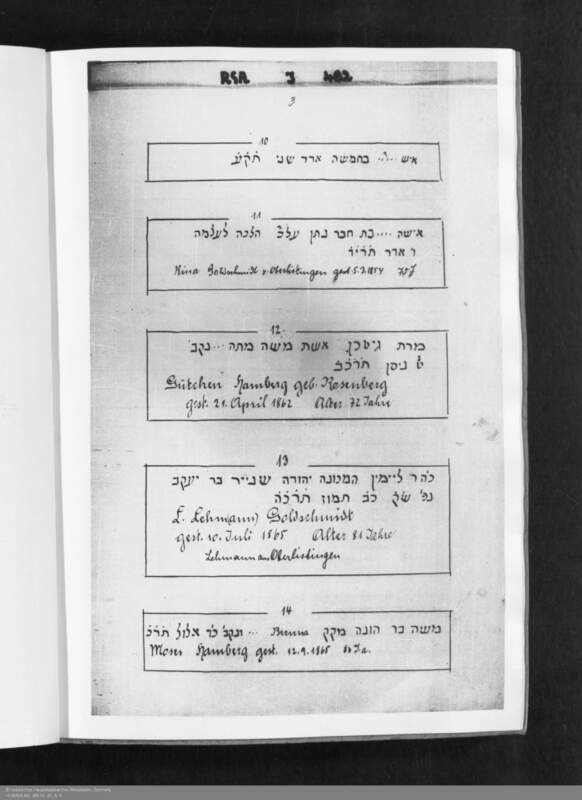 One reason I am skeptical is that the Hessen archives have a transcription of Moses’ headstone, which indicates that he was born in 1785 and that his father’s name was Huna, not Juda. On the other hand, the first son born to Moses and Guetchen was named Juda, and that would suggest that perhaps Moses’ father was named Juda. 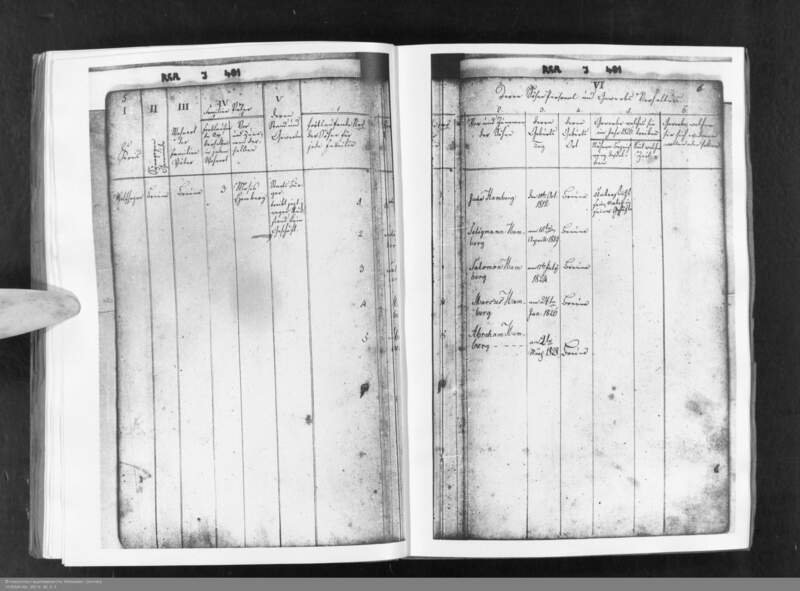 UPDATE: I’ve now seen, thanks to Hans-Peter Klein, a birth registry for Moses which gives his father’s name as Juda Moses, his mother’s as Rachel Simon, and his birthdate as 1777. Looking again at the headstone transcription, I now think it says he was 88 years old when he died, not 80, so 1777 as his birth year is consistent with the headstone. I still cannot explain why it has his father’s name as Huna. The Geni tree also asserts that Moses had a brother named Samuel, and I have found many records for Samuel Hamberg and his family. According to the death record I found for him, he died on December 11, 1857, at age 80, so he would have been born in 1777. Samuel married Kreschen Baruch, and they had five children. Their first-born son was also named Juda, lending further weight to the possibility that Juda was the name of the father of both Moses and Samuel. As you might imagine, having two men named Juda Hamberg in one small town can be quite confusing when looking at birth, marriage, and death records. To keep them straight, the Breuna records refer to Moses’ son as Juda I, since he was born first (on October 10, 1812, according to the synagogue registry page for Moses and his sons). Samuel’s son, Juda II, was born in 1820, according to the synagogue registry page for Samuel and his sons. Juda I was a horse dealer, and he married a woman named Dina Sauer. They had five children. Juda II was a merchant, and he married a woman named Breinchein Goldwein. They had five children also; one of them was the afore-mentioned Baruch Hamberg who led the Breuna Jewish community for almost half a century. You might wonder why I am bothering to report all this since neither Juda is a direct ancestor of mine. Well, it’s some background to the small world story referred to in the title of this post. Stepping back a bit, when I first started researching the Hambergs, the first place I went was to the Jewish Family Finder on JewishGen.org. I searched for the surname Hamberg in Breuna to see if anyone else was researching that family, and sure enough, there was someone listed, though he’d not been active for many years. There was no name disclosed, just a researcher ID number, so I sent a message to that researcher, not expecting a response, given how long it had been since that person had used JewishGen. Then I saw the Geni page for Moses Hamberg, referred to above, and I sent a message to the Profile Manager on that page. Little did I know that I had in fact sent two messages to the same person since the Profile Manager on Geni was the same person as the researcher listed on the Family Finder on JewishGen. That person, a man named Rob, contacted me by email later that day, and we began to exchange information. We exchanged information about the Hambergs and tried to sort out how we were related. (Rob pointed out that someone had made changes to his Geni information since he’d last looked at it, which is one reason I don’t like Geni—complete strangers can go in and change your tree without leaving any sources or explanations for the change.) We are still working on that, and it’s somewhat confusing because of the two men named Juda Hamberg discussed above. Rob and I are either fourth or fifth cousins, depending on whether he is a descendant of Moses Hamberg or Samuel Hamberg. At the moment I think he is the great-grandson of Baruch Hamberg, the renowned leader of the Breuna Jewish community, and thus a descendant of Samuel. But in addition to exploring the family history, Rob and I also exchanged current information about ourselves. I mentioned that I lived in western Massachusetts, and Rob said he lived in eastern Massachusetts. He mentioned the town where he lived (Arlington), and I responded that I also had once lived in Arlington over thirty years ago. 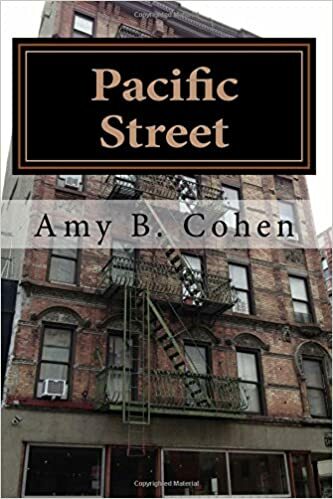 He then said he also had been living in Arlington that far back, and in fact once we exchanged street addresses, we realized that we had lived less than a mile from each other. I then mentioned that we had very good friends who had also lived for a few years in Arlington, but had since moved to a nearby town, and I mentioned their names. Rob emailed me back, saying that I had to call him because the coincidences were getting just too crazy. It turns out that our friends have been close friends with Rob and his family for over twenty years. We had undoubtedly all been at the same family celebrations for our mutual friends, including their daughter’s wedding just last year. As Rob and I spoke on the phone, I had goosebumps, and I have them again as I write down this story. Here was someone I had once lived near and with whom I shared good friends and who I might have even met or at least passed by in town or at a wedding. But we never knew we were cousins, linked as descendants of the Hambergs of Breuna. Isn’t it a strange and small world? I am now looking forward to having a chance to share all these crazy coincidences with Rob and his wife and our mutual friends over dinner sometime in the near future. This entry was posted in Breuna, Germany, Hambergs and tagged Arlington Massachusetts, Breuna, Germany, Hamberg, Hessen, Kassel by Amy. Bookmark the permalink. I know! I actually was strolling through the Longmeadow cemetery when I spoke to Rob, so that made it even eerier! In Germany, especially outside of the industrial areas and large towns, where war related destruction was very heavy, a great amount of archival material survived WW2 – so much less likely in occupied and ill-treated Poland. And now with digitizing, it can so easily be retrieved. So you are lucky to be searching in rural north-eastern Hesse. I know! I feel very, very fortunate. This is so wonderful Amy. I love the way the unfolding stories of the past are creating new relationships in the present. Thanks, Su! I am just bowled over by it—not something I was looking for or expecting when I starting looking backwards, but it sure is welcome! Some amazing coincidences, Amy! I find it so fascinating to learn (from this and other posts from you) that there were Jewish families living in small towns in Germany. I had assumed because of the general nature of “history classes” that most Jews lived in large cities in “western” countries (as opposed to eastern Europe, Russia, etc). It was a revelation to me as well. I assumed that my ancestors came from bigger cities in Germany. These small towns are fascinating to me. I am hoping to visit them in the next few years!